This paper presents the setting up and the analysis of a series of simulations of dwarf galaxies placed on different orbits around a Milky Way-like galaxy, in order to learn about the properties of their tidal tails. Tidal tails in the dwarf galaxies orbiting our Milky Way are hard to observe, and these authors will show why. According to our current view of structure formation in the Universe, galaxies form via mergers and accretion of smaller objects. Thus, tidal effects play a major role in shaping galaxies, including our own. The study of tidal tails in the Local Group has focused so far on globular clusters, since they are closer to the Galactic Centre than dwarf galaxies, and therefore 1) easier to disrupt, and 2) equipped with plenty of photometric and kinematic data. However, there is some (though debated) evidence of tidal features around dwarf satellites of the Milky Way, and the analysis of such tails could help to constrain the gravitational potential of our home-galaxy (see this paper). Figure 1 (adapted from Lokas et al 2013). Left column: from top to bottom, orbits O1-O4 projected onto the initial orbital plane. Right column: for the same orbits, projected on the same plane, 1% of stars in the dwarf and its tails (see text for details). 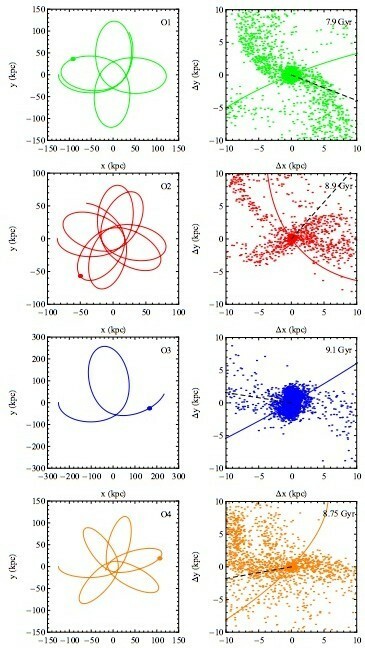 Building on the pioneering work of Klimentoski et al (2009), the authors construct a particle model for a dwarf galaxy, and a particle model for the Milky Way, and then place the dwarf-model on a orbit around the Milky Way-like galaxy, and evolve the resulting system using collisionless N-body simulations. The particle model for the dwarf galaxy is an exponential disk of stars embedded in a cosmologically motivated NFW dark matter halo. The particle model for the Milky Way-like galaxy is that constructed by Widrow & Dubinsky (2005), and consisting of an exponential disk of stars, a bulge, and a NFW halo, with specific values for the parameters so to resemble our galaxy. The dwarf model is placed in seven different orbits (O1-O7) around the Milky Way-like galaxy. This bunch of orbits, some of which are shown in the left column of Figure 1, allows to explore the relevant range of orbital eccentricities and sizes. For instance, O2 is similar to the current best-guess for the orbit of the Sagittarius dwarf, and O3 reminds of the Large Magellanic Cloud. Since the potential of the Milky Way is not exactly spherical, none of the considered orbits is exactly planar (here is a must-read about the orbits of stars). In practice, the dwarf-model is placed at the apocentre of each different orbit, and it is given a mildly prograde angular momentum. Then, the evolution of the resulting N-body system is followed for 10 Gyrs using the N-body code PKDGRAV (Stadel 2001). As already found in previous works, the main body of the dwarf orbiting the Milky Way-like host undergoes a morphological and dynamical transformation: its stellar component evolves gradually from a disk to a bar to a spheroid, and the initial ordered rotation of the stars gives way to more and more random motions. One only needs to wait long enough, and a spheroidal galaxy will form. During this process, a substantial fraction of mass, both dark and stellar mass, is lost via tidal stripping. This material originates tidal tails on both sides of the dwarf, and such tails move on their own orbits around the main galaxy. The right column of Figure 1 shows the stellar component (only 1% of the stars is plotted) of some dwarf galaxies and of their tidal tails in the immediate proximity. The stellar density of the tail evolves in time, going through minima and maxima. 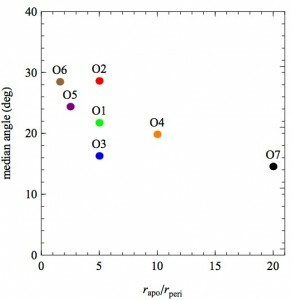 Here, the authors plot the stellar density in the tail at its last maximum, which occurred at the position marked by a dot onto the orbit in the corresponding left panel. Where does the dwarf end? Where do its tails begin? First, the authors examine the transition between the main body of the dwarf and the tidal tails, by introducing the “break radii”. These break radii are defined as the radii at which the stellar density profile is steepest, i.e. the density slope has a minimum. At radii larger than the break radius, the stellar density flattens again, rather than steepening all the way to infinity – as it would be the case if there were no tidal features. Figure 2 (from Lokas et al 2013). The variation in time of these break radii (and hence of the stellar density profiles of the dwarfs) displays a clear pattern, as shown in Figure 2 for all the explored orbits O1-07 , with solid lines of different colours (the colour-code is as in Figure 1). In Figure 2, the dotted vertical lines represent pericentre passages. Since tidal forces strongest at pericentre, the stellar distribution of the dwarf is stretched as the dwarf approaches the pericentre of its orbit. Hence, the break radii increase up to the strong values of the peaks in Figure 2, which indeed follow the pericentre passages. Right after the pericentre, the stellar density is trimmed again, and the break radii fall to their smallest values. In Figure 2 we also see how the maximum break radius decreases in subsequent apocentres, due to the mass loss of the dwarf via tidal effects. The smaller the pericentres of the orbits are (as it is the case for orbits O2 and O4), the stronger the effect is, and we can see deeper peaks in Figure 2. The almost circular O6 orbit shows instead very little evolution of the break radius over the orbital time. Somehow, the break radius must be related to the tidal radius, which in this configuration can be conveniently defined as the radius, on the line joining the host and the satellite, where a star in the satellite experiences no acceleration (King 1962). (For a nice explanation of the tidal radius of a rigid body in the simplest spherical case, have a look at Nathan’s astrobite.) Tidal radii can be computed with a semi-analytical formula, and they are overlaid in Figure 2 with coloured dashed lines. It appears that the break radii are always “delayed” with respect to the tidal radii, because the dwarf needs some time to dynamically respond to the tidal forces exerted by the Milky Way-host (whereas in the semianalytic approximation the tidal forces act instantaneously). The authors then move on to measure the stellar density in the tails (the radius Rtail is defined as twice the maximum value of Rbreak). They find that for all orbits the density distribution in the tails is well approximated by a r-2 law, hence the tails are well approximated by cylinders of constant density (when such a density distribution is probed in spherical shells the resulting slope is in fact -2). The outer profile of the dwarf’s main body is described instead by a r-6 law. The process of mass loss is not instantaneous, and it is not confined to the pericentre passage, even for the most eccentric orbits. Instead, the lost material is fed into the tails gradually, and the maximum density of the tails is reached a substantial fraction of orbital time after the pericentre passage (look at the dots in the left column of Figure 1!). The evolution of the density shows a characteristic pattern which is preserved at all times and for all orbits: it has a minimum at or just before pericentre, and a maximum after the pericentre passage but before the apocentre is reached. Figure 3 (from Lokas et al 2013). For the different orbits (characterized by different colours, as in Figure 1), orbit-averaged median angles of the tails with respect to the line-of-sight towards the centre of the dwarf galaxy. Finally, the authors analyze the orientation of the tails with respect to an observer located near the centre of the host galaxy. They find that the tails are perpendicular to this line-of-sight for only a short period of time close to the pericentre. For most of the time, however, even for the almost circular orbit, the angles between the tails and the line-of-sight to the centre are low, with orbit-averaged medians below 30 degrees. For more eccentric orbits, those with higher values of rapo/rperi, these median angles are lower, as shown in Figure 3. As can be intuitively understood, for the more eccentric orbits the maximum density of the tail is higher, since for a tighter orbit the stripping of stellar material from the dwarf is more effective. Therefore, tidal tails should be easiest to detect for dwarf galaxies soon after their pericentre passage, but unfortunately this is the time when their density is also lowest. This makes their detection in the dwarf spheroidal galaxies of our Local Group pretty unlikely. I am a fourth-year graduate student at the Ludwig Maximilians Universitaet of Munich, Germany. I am doing my PhD at the Max Planck Institute for Extraterrestrial Physics, where I belong to the Dynamics group led by Ortwin Gerhard. I am interested in galactic dynamics and modelling of galaxies. Too many galaxy pairs in the Local Group? Searching for molecular gas in dwarf galaxies How Green Can a Planet in a Resonant Orbit Be? How Weird Is Our Solar System?